Grow Younger As You Age! Normal aging does not have to be plagued by heart attacks, strokes, cancer, diabetes, falls, brittle bones, obesity and dementia. Your lifestyle is responsible for 70% of aging and premature death; especially since we are all predestined to live well into our 80’s and 90’s. Longevity is a fact of life today. Think about what you want the last third of your life to look like. Will it be active and fun or will you be one of those people with need of a cane, walker or wheel chair and a burden on others? This scenario is completely avoidable, but you need to start NOW eating better and exercising! 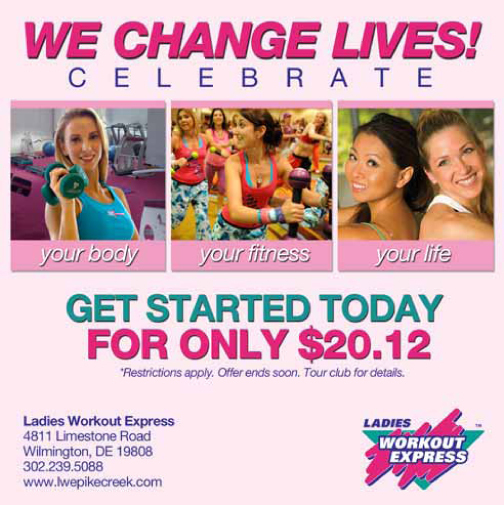 Ladies Workout Express-Pike Creek is a fitness center designed for women of all ages, sizes and shapes. Our club is for the beginner exerciser, as well as, for those that are very fit. At LWE there is always someone to help you get in shape or to stay in shape and we make it fun. Our circuit of workout equipment was originally designed for physical therapy so it is very user friendly. We also have cardio equipment, personal trainers, boot camps, ZUMBA, plus numerous other classes. There are free weights, weighted hula hoops, exercise balls, bands, etc. and lots of support to reach your personal fitness goals. Exercise doesn’t have to be boring. We have made our club a place where women can go that our trainers and members know your name and will support all your efforts. You can feel comfortable exercising without being judged by others and leave knowing that you are healthier for your efforts. Our goal is to help you get in shape and stay in shape. We invite you to come try our club to see how much better you will feel. 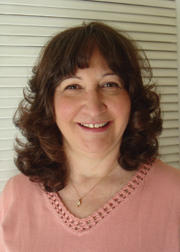 Margaret and Earl Bain have owned and operated Ladies Workout Express for the past 8 years. ← Previous Story Live Younger Longer!